Sacred Dance Global Outreach (SDGO) is an initiative of the Sacred Dance Guild that raises awareness of dance as a unifying, transforming and healing force in the world, and actively supports dancers who are living out these principles under conditions of poverty, violence and oppression. Through SDGO, the SDG sponsors fundraising events or other initiatives that support dancers in need. Proceeds from these events, which can include funds, dancewear or other items, are donated to deserving groups identified by the SDG. 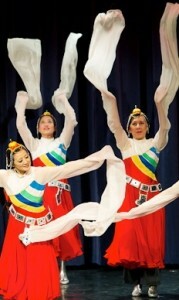 Melody Chinese Dance Troupe performing “Peaceful Joy” at CultureFest II. Photo credit: Ted Castro. This event featured an afternoon of multicultural dance presentations in a benefit concert including dancers of all ages. The beneficiaries of CultureFest were Young Dancers of Armenia, a project of Children of Armenia Fund (COAF), a non-profit organization that strives to improve the lives of youth in rural villages of Armenia. COAF encourages young Armenians to discover and preserve their cultural heritage, particularly through dance. CultureFest raised over $1,000 plus 15 boxes of brand new dancewear and shoes, valued at more than $20,000, donated by the North East Dance Retailers Association. This event featured an afternoon of multicultural dance presentations and a benefit concert including dancers of all ages. The intended beneficiaries of CultureFest II were the ballet studio of the Croatian National Theatre in Osijek and COAF (Children of Armenia Fund). A donation of 36 boxes of new dance supplies was shipped to Croatia with the generous help of the New England Friends of Croatia organization. The dance supply shipment delighted the Croatian dancers and was instrumental in saving their dance company. SDG was unable to arrange the shipping of the donated dance supplies to COAF in Armenia. Instead arrangements were made to distribute 26 boxes of new dance supplies to dancers in need in the Boston metro area with the help of the Dancing Arts Center in Holliston, Massachusetts. CultureFest II raised over $1,000.00 plus 62 boxes of brand new dancewear and shoes, valued at more than $20,000, donated by the North East Dance Retailers Association. Following the first Sacred Dance Journey to Bali, participants were honoured to be invited to the Yayasan Widya Guna to share sacred dance with the children of this amazing school. SDG member Tricia Lee has had a long standing relationship with the Yayasan and the SDG is grateful that she included this important SDGO element in the Sacred Dance Journey. Yayasan in Bedulu supports underprivileged Balinese children in receiving their education by covering their school costs. Those who do not have a family or a home are provided with food and shelter. They assist many children with different circumstances, including children with physical and/or mental disabilities, orphans and street children. Nyoman and Ketut, who set up the school originally in their own family compound, are inspirational in their achievements and their dedication to the students and welcome sponsorships for individual students, the money going directly to a personal student account with no administrative deductions – click here for details! 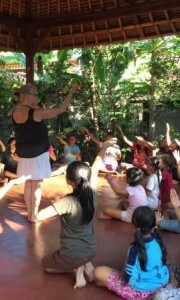 The participants had a wonderful afternoon engaging the children in movement and dance, including a “Mandala Dance” and were thrilled when the children demonstrated and then taught them some Balinese movement in return. The SDG made a modest financial donation to the Yayasan to contribute in a small way to their continued journey. For the second year, participants of the SDG’s Sacred Dance Journey to Bali were privileged to spend an afternoon with the children at the Yayasan Widya Guna. The participants shared some dances with the children and then the children shared their dances with the adults! It was a magical and memorable time. The children loved the energetic rendition of “Deep and Wide” and some of the other joyful songs but also quietly held their hearts for both the Mandala Movement and “The Face of God” pieces. It was truly a heart-warming opportunity to move together. The SDG also contributed a small financial donation. Participants left feeling humbled in spirit after having shared much joy with the beautiful students who live on the edge of what many would consider poverty. Would you like to get involved with SDGO? Consider hosting an SDGO fundraising event. It could include a dance workshop, a benefit concert, or both. Or you could donate a portion of the proceeds from an already established event, such as an annual performance or open house. The choice is yours! The SDG will provide guidance and support for coordinating your event. The SDG is also interested in collaborating with groups and individuals on projects that are consistent with the mission of SDGO. Contact us for more information. Do you know of a deserving dance group that SDGO could support? Please contact us and let us know why this group deserves our support and how you are connected to them.